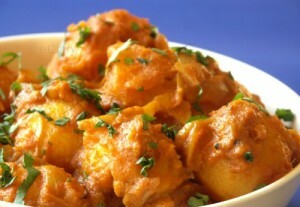 Dum Aloo: Dum Aloo (also spelled as Dam Aloo) or Alu Dum belongs to, specifically, Kashmiri cuisine. The potatoes, usually smaller ones, are first deep fried, then cooked slowly at low flame in a gravy with spices. Dum Aloo is a popular recipe cooked throughout India. Rinse the baby potatoes under running water. Wipe the washed potatoes dry and keep the peel on. Heat the oil in a pan, for deep frying, on medium heat. Deep fry the wiped baby potatoes till they are golden brown and completely cooked. Grind the soaked cashews to a smooth paste. Grind the onions, ginger and garlic to a smooth paste. Blend the tomatoes to a smooth puree. Heat 2 to 3 tbsp oil in a pan, on medium heat. Add in the black cardamom and cinnamon. Fry the paste, on a low flame, till it becomes golden brown and the oil separates. Add the tomato puree to the browned paste. After 3-4 minutes, add in the turmeric powder, coriander powder, red chili powder, garam masala powder and fennel powder. Fnd fry till the oil separates. Add in the cashew paste and yogurt. Fry the mixture till the oil separates. Add about 2.5 to 3 cups of water. Bring the gravy to a boil. Simmer for some 4-5 minutes till the gravy thickens. Add lemon juice and season the gravy with salt. Dum aloo is ready to be served. Serve dum aloo hot with rotis or steamed basmati rice. If you have any queries regarding the Dum Aloo recipe, please leave a comment.